"If I can't have too many truffles, I'll do without truffles." One of the things Nick enjoyed most during our trip to New York was a stand that made crepes in Bryant Park, particularly a chocolate crepe. To call it delicious is an understatement. I shot this short video, which shows the delight Nick got in receiving, and topping it up with a few (OK, more than a few) sprinkles of extra chocolate powder. "Research tells us 14 out of any 10 individuals likes chocolate." 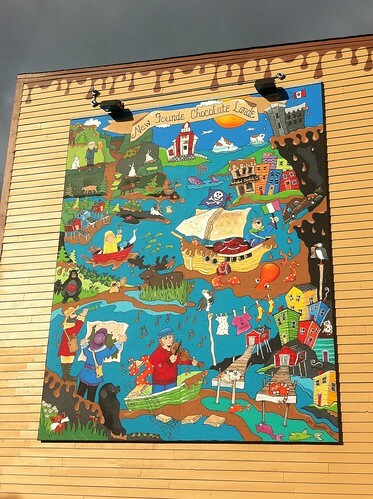 This is the mural on the wall outside the Newfoundland Chocolate Co. on Duckworth Street.